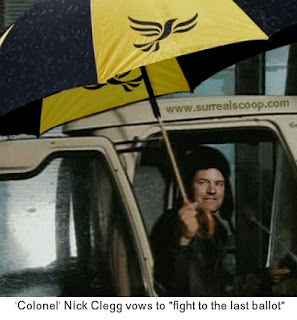 As the rival camps set out their cases for the referendum in May, Nick Clegg, leading champion of the Yes campaign revealed his desire to spread AV to all walks of life and to realise his dream he was prepared to fight to the last councillor. Under the new Alternative to Voting system, traditions such as the competing party getting the most points being declared winners will be swept aside as the 2010 LibDem People's Democratic revolution continues. Today's Grand National will be awarded to the leading horse whose jockey is wearing Yellow silks, and the prized Master's green jacket will be handed from last year's winner to the player with the lowest 72-hole score, who will then hand it on to Mr Clegg who will pronounce himself winner and the jacket to be yellow coloured.